Despite an early lead, the Aspen High School football team couldn’t hold off host Delta on Friday, falling 49-40 in a wild game to open Class 2A Western Slope League play. Aspen led 14-0 and again at 20-7 after the first quarter, with quarterback Tyler Ward and company looking unstoppable. But the Panthers, playing in front of their homecoming crowd, scored a pair of touchdowns in the second quarter and got their defense in check to take a 21-20 lead into the halftime break. The teams split touchdowns to open the third quarter, a failed 2-point conversion by Aspen on its score keeping Delta ahead at 28-26. The tradeoff continued, this time with Ward finding senior receiver Noah Hollander for an 81-yard touchdown to make it 35-32 Delta late in the third quarter. However, the Panthers took control from there, scoring back-to-back touchdowns, the second of which giving Delta a 49-32 lead with 7:57 to play in the fourth quarter. A Max Ufkes touchdown with just under five minutes remaining cut Aspen’s deficit to nine points, but that proved to be all the closer the Skiers would get. Delta improved to 4-1 overall and 1-0 in WSL play with the win. The Panthers host No. 4 Rifle next week. Aspen dropped to 3-2 overall and 0-1 in WSL play. The Skiers will host Moffat County on Friday in only their second home game of the season. No. 6 Basalt (4-0) plays at 1 p.m. Saturday, Sept. 29 in Craig against Moffat County (2-2) in their league opener. New Castle — It wasn’t pretty, but the No. 4-ranked Rifle High School football team did enough Friday night on the road in New Castle to defeat the Coal Ridge Titans, 36-8, opening up 2A Western Slope League play on a positive note. The game featured a combined seven turnovers and a rare safety, making for a mistake-filled game on a chilly night in New Castle. In fact, four of the seven turnovers occurred in the first quarter as both teams got off to slow starts. 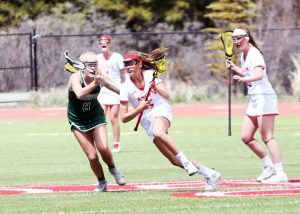 Fortunately for Rifle, the Bears were able to overcome the sloppy start to pick up their first win in 2A Western Slope League play after dropping down from 3A last season. Rifle’s win pushes the Bears to 5-0 (1-0 2A WSL) on the season. The Bears travel to Delta next Friday for a league matchup with the Panthers at 7 p.m.
Coal Ridge falls to 1-4 (0-1 2A WSL) on the season. The Titans travel to Basalt next Friday for a showdown with the Longhorns at 7 p.m.